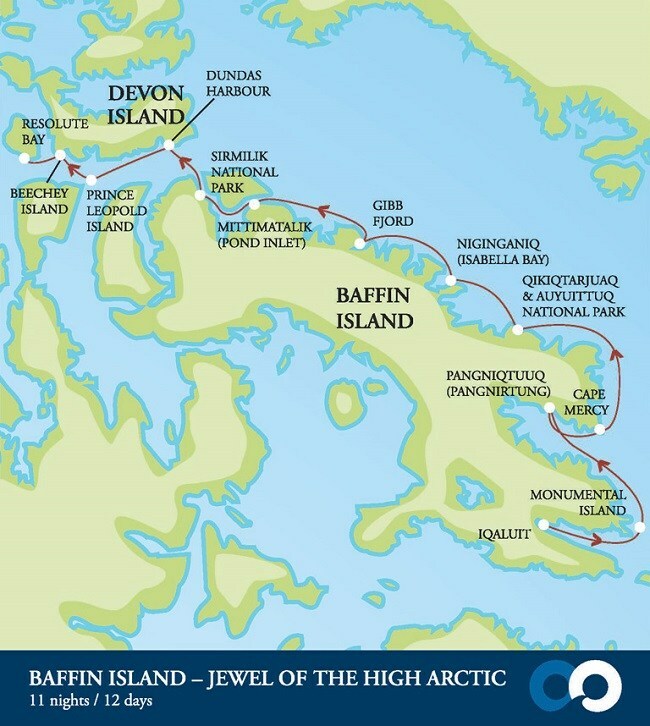 Baffin Island – Jewel of the High Arctic – The Great Canadian Travel Co.
US$1,000 travel credit per person for reservations made by 31 May, 2019 for this expedition. Explore the east coast of Baffin Island and discover majestic mountains, great glaciers and fjords far below. Immerse yourself in the traditions and cultures of Northern Canada as you encounter a variety of birdlife, marine wildlife, and maybe spot a polar bear or walrus or two along the way. Special offer discounts are not reflected in the regular rates listed below. Reduced pricing will be quoted at the time of your inquiry. Prices are shown in US$ and are per person based on three people sharing a triple cabin or two people sharing regular cabins or suites. Single cabins are available for 1.5X the per person twin occupancy price for regular cabins or 2X for suites. Single rates are not available in the triple cabin category. Charter price includes taxes and fees. Departing Ottawa, you will board your flight to Iqaluit, Baffin Island. When you arrive, you will take part in a walking tour of the town and then board your expedition ship, the Akademik Ioffe, in the afternoon. Enjoy a welcome cocktail as you start your adventure through one of the most remote places on earth, Baffin Island. 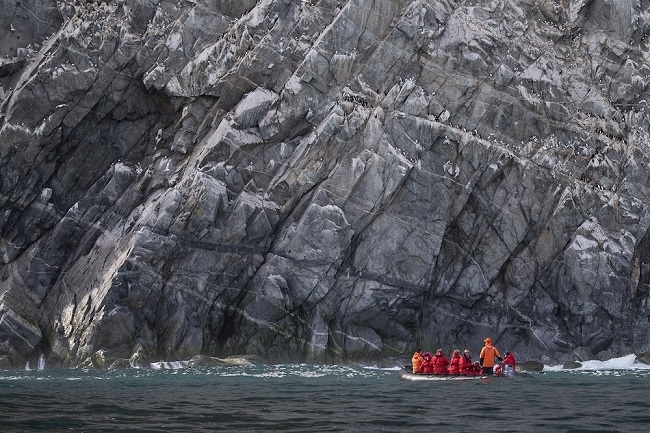 Today, you will explore the shoreline of Monumental Island, a well-known location for walrus. 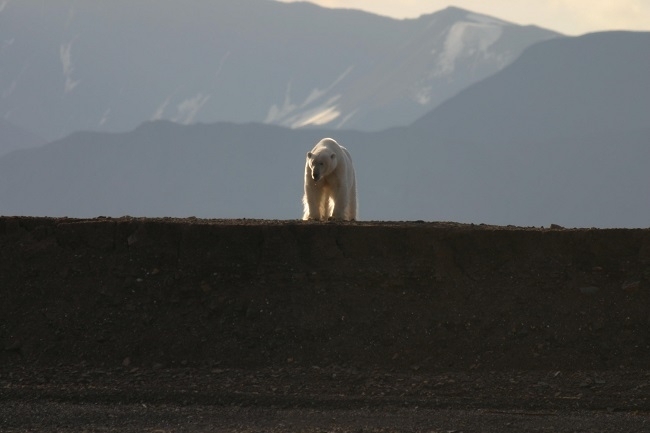 Keep an eye out for polar bears as well, as they are also known to be seen here. The village of Pangniqtuuq (Pangnirtung) is situated between the mountains and the sea and is the western gateway to Auyuittuq National Park. Immerse yourself in the tradition and culture in this small community as it is well-known for its contemporary arts and crafts. You will be able to visit the Angmarlik Visitory Centre which has an informative interpretive display telling the stories of the Thule and the modern Inuit. This fjord straddles the Arctic Circle and, depending on the weather, you will cross it either on the ship, by zodiac boat, or maybe even on foot. Whatever way you take it is always a moment never to be forgotten. The Sunshine Fjord has great hiking trails, from long routes that offer fantastic views of the surrounding areas to shorter, less strenuous options along the shoreline. If you would like to try your hand at kayaking, there may also be an opportunity to take to the sheltered waters of the fjord in a sea kayak. In a land dominated by steep and rugged mountains, great glacial systems and roaring rivers, this national park is one of Canada’s most spectacular. For this part of your adventure, you will be joined by a skilled local guide who is able to interpret the cultural and natural history of the area as you walk; You will learn about the flora and fauna, the geological and glacial systems. After a stimulating day exploring, you will continue north along the coastline, travelling deeper in to the Arctic wilderness. This bay is an important summer habitat and feeding area for the endangered bowhead whale. These extraordinary creatures are able to break the sea ice with the crown of their head. You may also spot polar bears, ringed seals, Canada Geese, Snow Geese and narwhal in this area. The expedition ship will look small this morning as you make your way into Gibbs Fjord. All around you will be towering peaks and icy glaciers as you cruise through the water. Almost at the far northern region of Baffin Island, a broad channel occurs in which the remote Inuit community of Pond Inlet sits. You will be able to wander through the Natinnak Centre, where cultural exhibits show the daily life, culture and history of the people of the North. You will see Inuit carvings, jewellery and other traditional crafts on display. This community is also the main access point to Sirmilik National Park, featuring mountains, ice fields, glaciers and large seabird colonies. 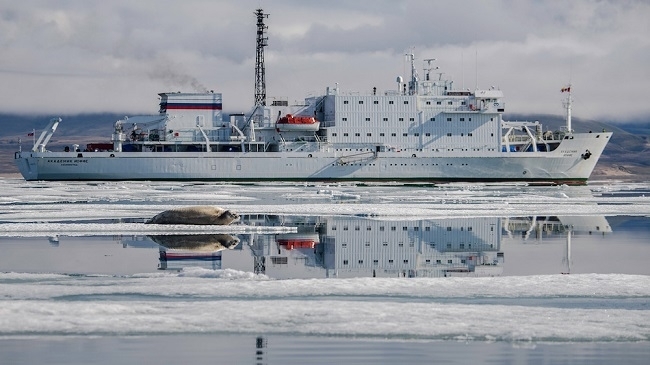 Today you will cross Lancaster Sound, the wildlife ‘super highway’ of the Arctic. 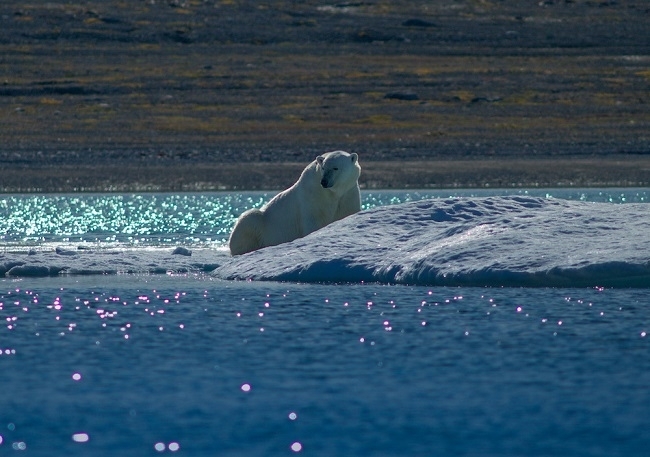 The water from the Atlantic and Arctic Oceans, and the northern archipelago of islands meet at this point creating a rich source of nutrients and food for an abundance of Arctic wildlife. A plan to visit the old Royal Canadian Mountain Police outpost in Dundas Harbour on Devon Island and then venture into Crocker Bay will take the rest of the day. With a population of several hundred thousand birds, it makes this island one of the most significant bird sanctuaries in the entire Arctic ecosystem. Keep your eyes open for belugas, narwhals and bowhead whales as these species are also often spotted here. The final shore landing is on Beechey Island, the location where Sir John Franklin’s doomed expedition spent its last winter in 1845 before it disappeared into the unknown. In 2014, a joint Parks Canada and Royal Canadian Geographic Society expedition found the HMS Erebus in the Victoria Strait. On the shores of Beechey Island, you will find grave markers on a remote windswept beach, paying homage to the lives that were lost on board the HMS Erebus. In the evening, you will enjoy a special Captain’s dinner while you reflect on the many memories you created in the last 11 days. As you arrive into Resolute, your cruise adventure comes to an end. A flight to Edmonton is provided and a transfer from the airport into a central downtown location, if needed. Or, you may choose to stay at an airport hotel, especially if you have an early flight home tomorrow morning.